We-Ha.com's very own Ronni Newton, the Noah Webster Award winner, with former Chamber of Commerce Board Chair Dave Calibey. West Hartford's Chamber of Commerce 31st Annual Meeting and Awards Dinner. Photo by Ryley McGinnis. 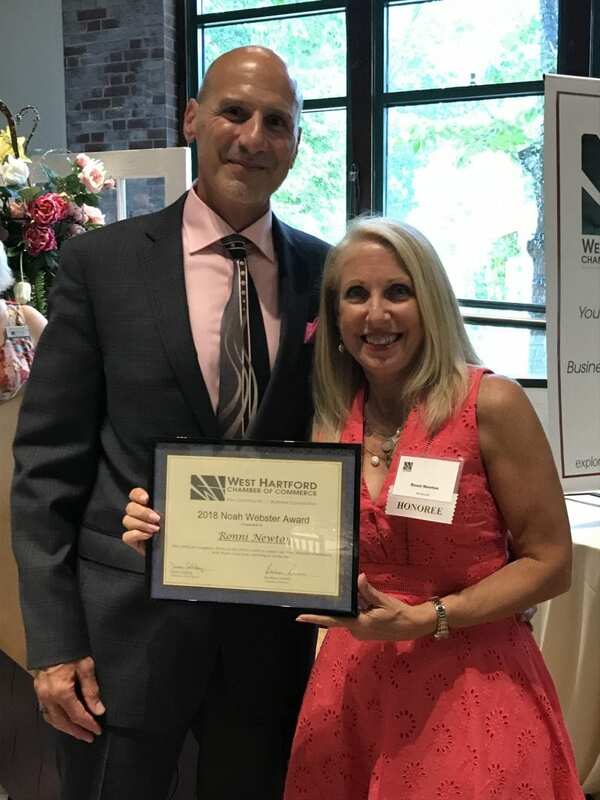 The West Hartford Chamber of Commerce recognized extraordinary businesses and individuals who positively contributed to the West Hartford community through their hard work and perseverance at their annual meeting Monday evening at the Pond House Café. 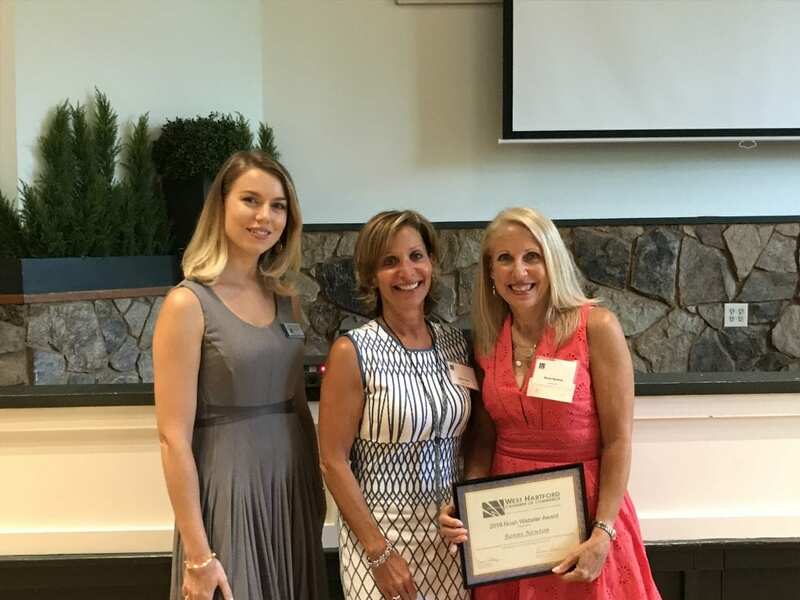 We-Ha.com’s very own Ronni Newton, the Noah Webster Award winner, with (left to right) Chamber of Commerce Associate Director Morgan Hilyard and Mayor Shari Cantor. West Hartford’s Chamber of Commerce 31st Annual Meeting and Awards Dinner. Photo by Ryley McGinnis. 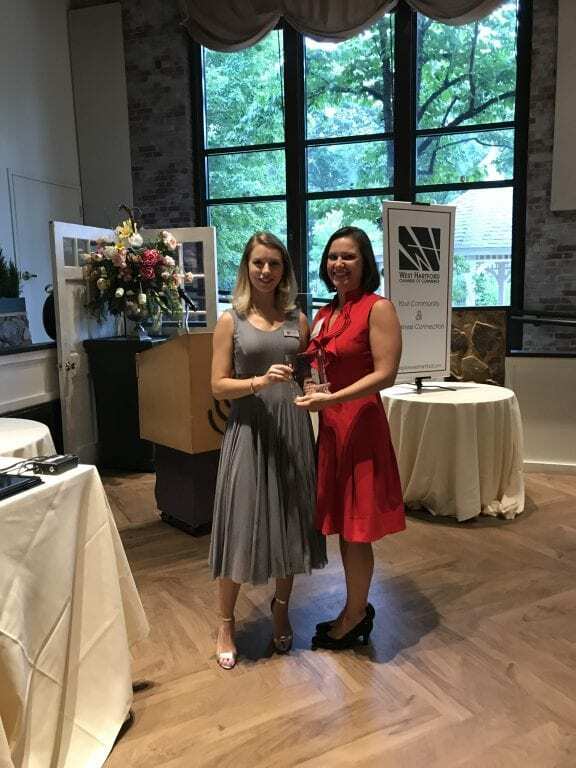 The West Hartford Chamber of Commerce elected board members and honored member businesses for their outstanding work in several categories at its annual dinner Monday night at the Pond House Café, and we-ha.com Managing Editor Ronni Newton received the 2018 Noah Webster Award at the West Hartford’s Chamber of Commerce 31st Annual Meeting & Awards Dinner for her contributions to the community on Monday evening. 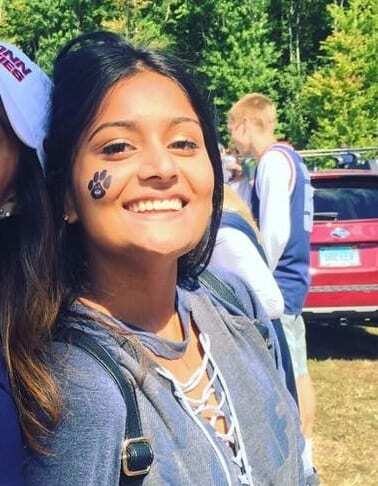 Calibey explained that through Newton’s late night publications, persistent reporting, and willingness to attend countless events, she has kept the West Hartford community well-informed and up-to-date on all of its many whereabouts. 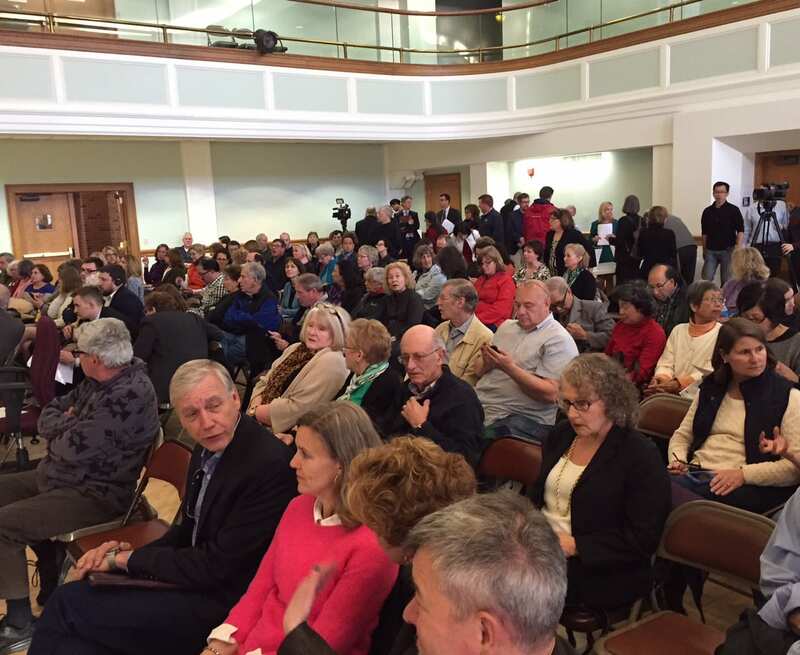 During her thank-you speech Newton said that when she received a phone call from Chamber of Commerce Executive Director Barbara Lerner, she immediately started to take notes about the event thinking that she would later have to report on it. 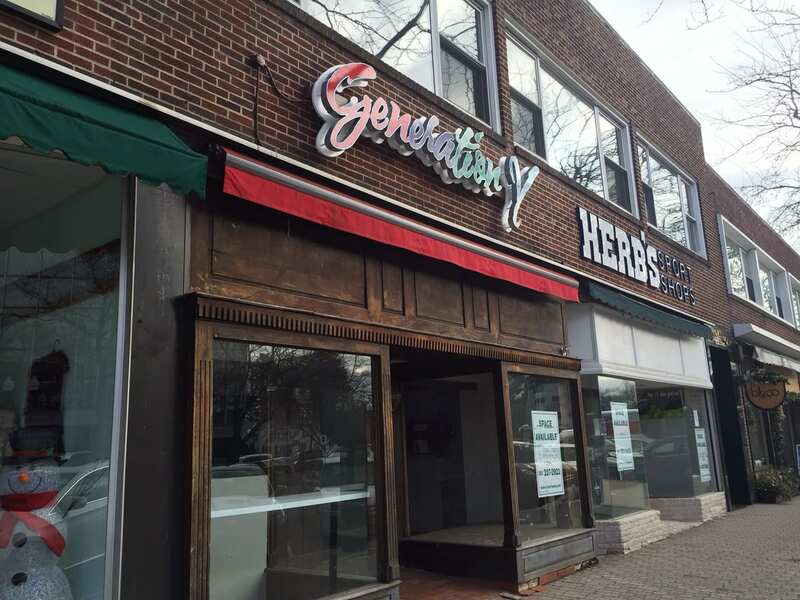 Little did Newton know that Lerner was calling to inform Newton that she would be the recipient of the award for her hard work, dedication, and passion for the town of West Hartford. 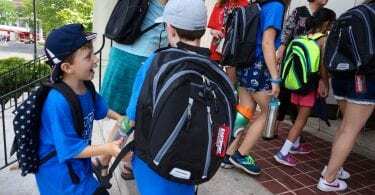 “I was floored, humbled, and really, really surprised … and I wanted to thank everyone who reads we-ha.com,” Newton said. Newton also thanked her family for their support. 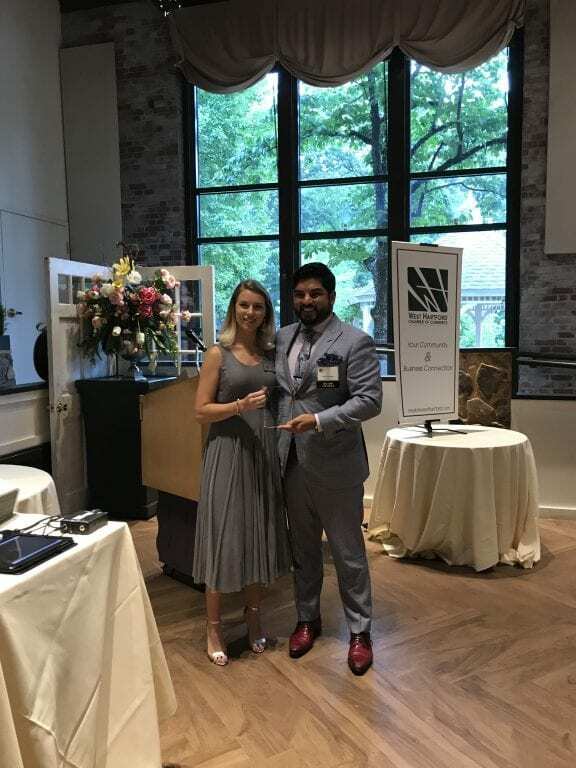 During the dinner, which was held at the Pond House Café in Elizabeth Park, the Chamber of Commerce also recognized the growth and accomplishments of local businesses as well as the positive impacts that extraordinary West Hartford residents have contributed to the community. Several business owners were highlighted in a featured video and received the Chamber Spotlight on Success awards. 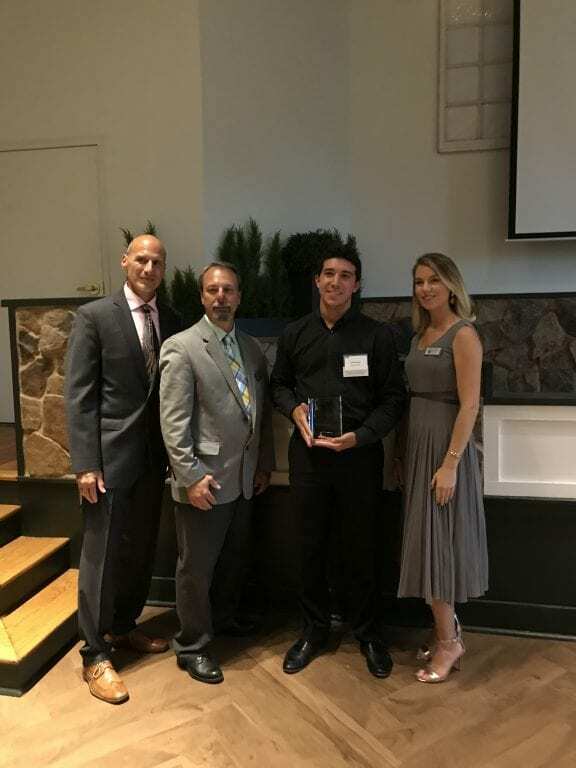 The individuals who received the awards were Steve Morris of Favarh – The Arc of the Farmington Valley, Andrew Bachman of Trout Brook Tree Services, Helen Brower and Cesar Contreras of Sally & Bob’s Eatery, Dave Souza of GOLFTEC, Matt Banever of Daswani Clothiers, and Cailin McBee of Balance Massage Therapy. 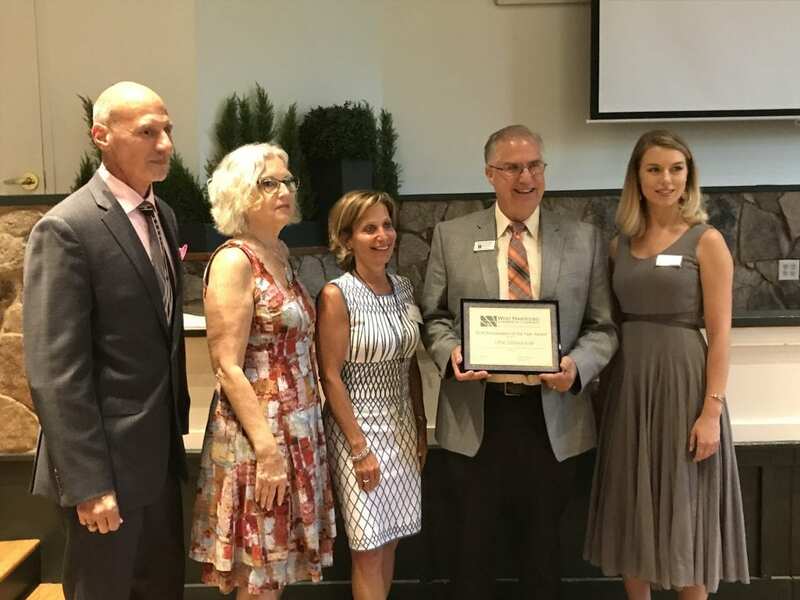 Volunteer of the Year award winner Bob Newbold (center) with (from left) former Chamber Board Chair Dave Calibey, Mayor Shari Cantor, Chamber Associate Director Morgan Hilyard, and Chamber Executive Director Barbara Lerner. West Hartford’s Chamber of Commerce 31st Annual Meeting and Awards Dinner. Photo by Ryley McGinnis. 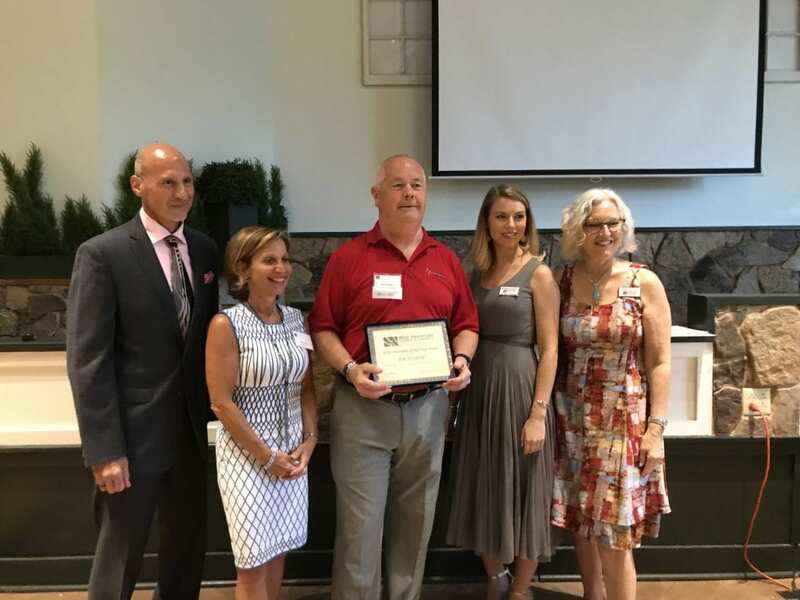 The Volunteer of the Year Award, which is awarded to a member of the Chamber for contributions to the organization and its members, was given to Bob Newbold for his advocacy for stroke awareness. Newbold, who suffered from a stroke last year but was able to fully recover, explained that his goal is to have future stroke victims have the same, positive outcome that he had. Rennie Polk of the American School for the Deaf announced this year’s nonprofit grant recipients – the Noah Webster House & West Hartford Historical Society, which received $1,500 for educational programs; the Tri-Town YMCA which received $1,500 for their summer STEM programs; and the Fern Street Food Ministry who was awarded $2,000 for a new refrigeration system to help with the rising number of people who use the food pantry. 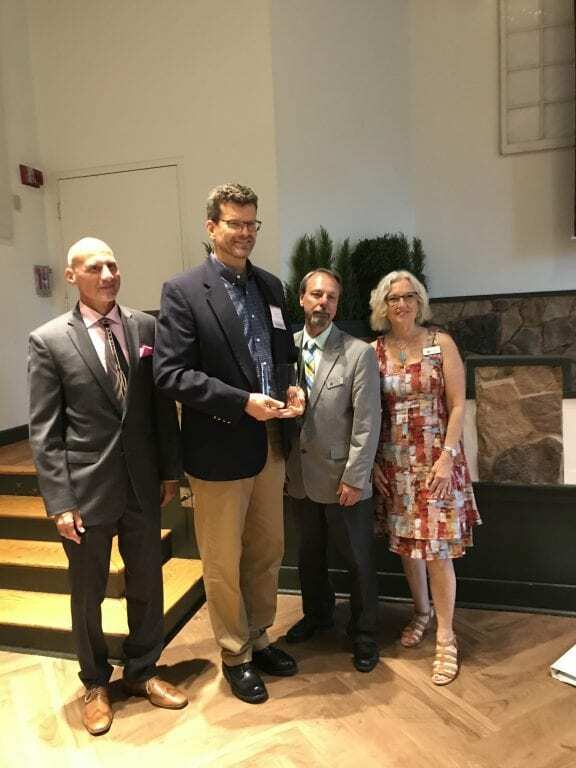 The Chamber also recognized Chip Janiszewski as the recipient of Ambassador of the Year Award, and the Foundation for West Hartford Public Schools was given a grant for Sedgwick Middle School’s robotics club that will fund purchase of a 3D printer and other equipment. 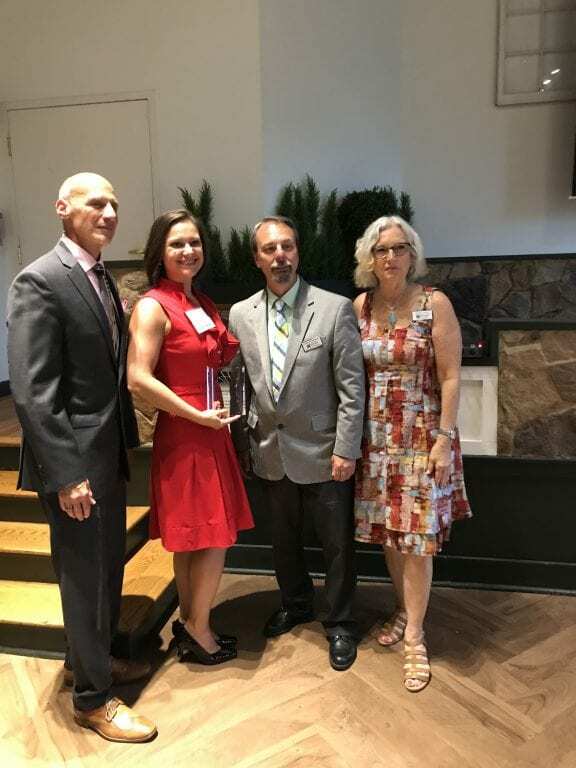 Ambassador of the Year award winner Chip Janiszewski (second from right) with (from left) former Chamber Board Chair Dave Calibey, Executive Director Barbara Lerner, Mayor Shari Cantor, and Associate Director Morgan Hilyard. West Hartford’s Chamber of Commerce 31st Annual Meeting and Awards Dinner. Photo by Ryley McGinnis. FLOW Spotlight recipient Lyle Rotondo (second from right) with (left to right) Dave Calibey, Robert Kulakowski, and Morgan Hilyard. West Hartford’s Chamber of Commerce 31st Annual Meeting and Awards Dinner. Photo by Ryley McGinnis. 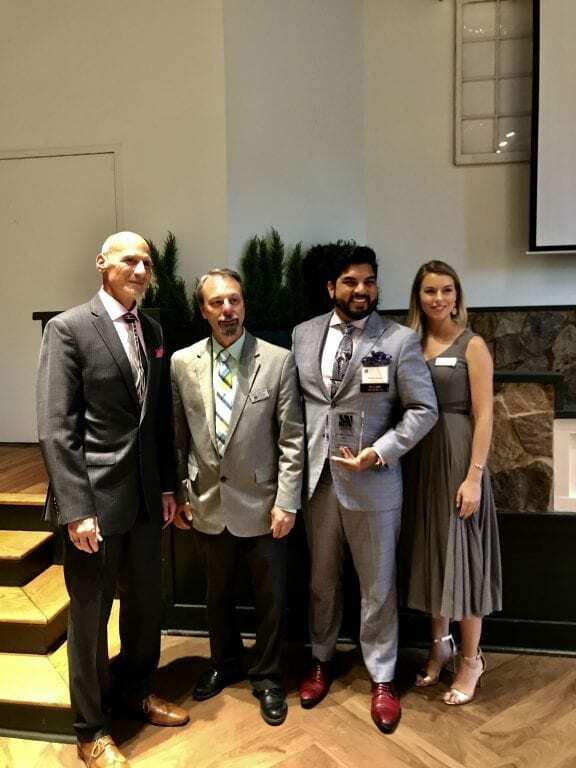 Success Story winner Dave Souza (second to right) with (left to right) Dave Calibey, Robert Kulakowski, and Morgan Hilyard. West Hartford’s Chamber of Commerce 31st Annual Meeting and Awards Dinner. Photo by Ryley McGinnis. 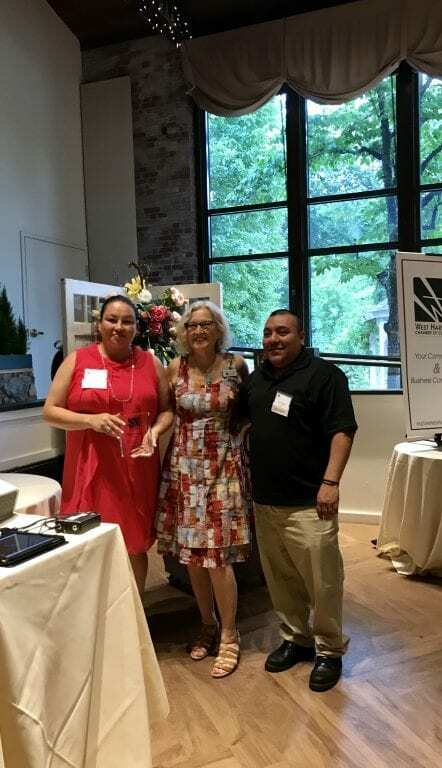 Success Story winners Helen Brower (left) and Cesar Contreras (right) with Barbara Lerner. West Hartford’s Chamber of Commerce 31st Annual Meeting and Awards Dinner. Photo by Ryley McGinnis. 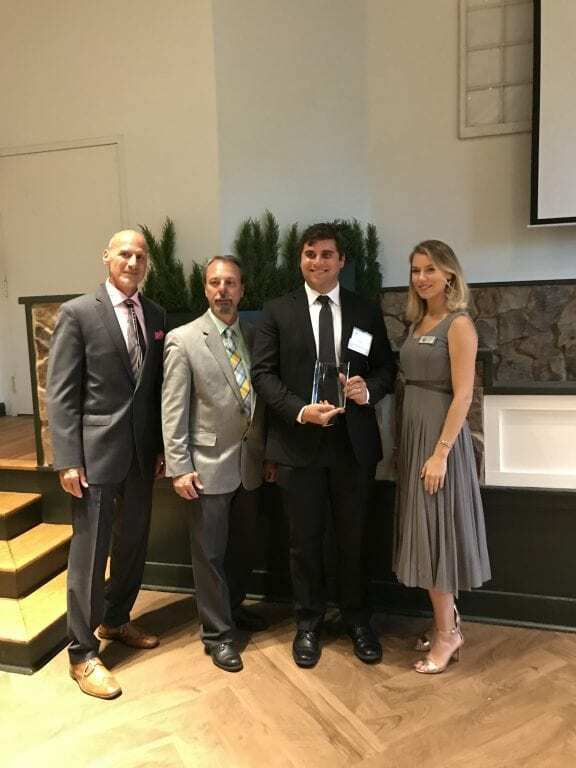 Success Story winner Matthew Banever (second to right) with (left to right) Dave Calibey, Robert Kulakowski and Morgan Hilyard. West Hartford’s Chamber of Commerce 31st Annual Meeting and Awards Dinner. Photo by Ryley McGinnis. Success Story winner Matthew Banever (right) with Chamber Associate Director Morgan Hilyard. West Hartford’s Chamber of Commerce 31st Annual Meeting and Awards Dinner. Photo by Ryley McGinnis. Success Story winner Cailin McBee (second to left) with (left to right) Dave Calibey, Robert Kulakowski and Barbara Lerner. West Hartford’s Chamber of Commerce 31st Annual Meeting and Awards Dinner. Photo by Ryley McGinnis. Success Story winner Cailin McBee (right) with Morgan Hilyard. West Hartford’s Chamber of Commerce 31st Annual Meeting and Awards Dinner. Photo by Ryley McGinnis. Success Story winner Steve Morris of Favarh (second to left) with (left to right) Dave Calibey, Robert Kulakowski and Barbara Lerner. 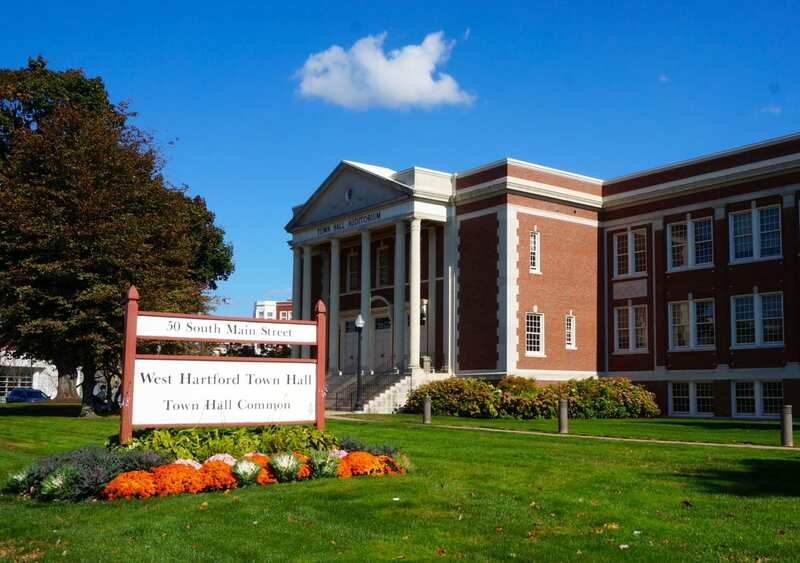 West Hartford’s Chamber of Commerce 31st Annual Meeting and Awards Dinner. Photo by Ryley McGinnis.